Clearbrook provides occupational, physical and speech therapy from licensed practitioners and assistants to aid in the treatment of our clients with developmental disabilities. Clients receive routine evaluations as well as ongoing individual therapy in private and group sessions which are integrated in the clients’ day program environments. For our clients that have incidences of behavior problems, Clearbrook will work with them to positively enhance their relationship to other people and their surrounding environment. Clients receive services in the clinic as well as in their home and day program. The Clinic provides training both internally and through workshops and conferences that are open to other professionals as well as the public. Clearbrook offers Clinical Services within the agency, while most other Adult Service Providers contract with outside consultants. Our model allows our clinicians to have more intimate follow up as well as provide staff training and services to the clients in their home and day program settings. How are clients referred to Clinical Services? The QIDP or case manager for the client submits a referral form to the Director of Clinical Services. The Director routes the referral to the appropriate therapist. The clinic’s goal is to respond to the referral within the 30 days. Are Clinical Services available to all of the clients? Yes. The degree of services provided depends upon the client. For example, all clients that reside in an ICF (Intermediate Care Facility) are required to be evaluated by a clinician. Clients that participate in other programs may be evaluated on an as needed basis. Behavior and counseling services are available to all Clearbrook clients. Where is the Clinic located? The clinic office is located at our Riley Building in Schaumburg, IL. Additional offices for occupational, physical, and speech therapy are located at our Krause Building in Rolling Meadows, IL. Clinicians often provide services at other day services sites as well as within an ICF (Intermediate Care Facility). What types of services does the Clinic provide? The Clinic provides evaluations and treatment by occupational, physical and speech therapists, licensed certified professional counselors, social workers, dieticians and Board Certified Behavior Analysts. Additionally, medical contracts are help with medical practitioners to include internists, neurologists, psychologists, and psychiatrists. Do Clinicians provide training? Yes. They provide ongoing training to Clearbrook staff. Are the Clinicians licensed? Occupational, physical and speech therapists, counselors and consultants are all licensed professionals. There are Board Certified Behavior Analysts on staff. Assistants, interns and behaviorists also provide services under the supervision of the licensed and certified professionals. Does the Clinic serve children and adults? The Clinic takes referrals from all of Clearbrook’s Adult Services Programs and our Home-Based Services. Our CHILD Therapy program addresses the needs of younger children. Licensed Speech Therapist (SLP) – Completes evaluations and provides therapy to clients receiving speech therapy. Supervises all interns and a speech therapy assistant. Speech Therapy Aide – Carries out objectives to enhance the quality of communication of the clients served. Licensed Occupational Therapist (OT) – Completes all of the evaluations and supervises the occupational therapist aide as well as any occupational therapy interns. Occupational Therapist Assistant (OTA) – Carries out many of the services recommended in the occupational therapy evaluations while working directly with the clients. Licensed Physical Therapist (PT) – Completes all of the evaluations and supervises the physical therapist aide as well as any physical therapist interns. 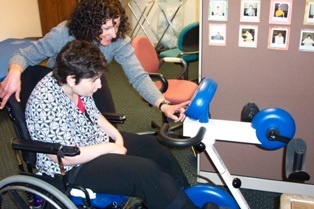 Ensures that the clients’ wheelchairs are appropriate in meeting the specific needs of each client. Physical Therapist Assistant (PTA) – Carries out many of the services recommended in the physical therapy evaluations while working directly with the clients. Licensed Clinical Social Worker (LCSW) and Licensed Clinical Professional Counselor (LCPC) – Provides individual and group therapy, as well as supervise interns who assist in carrying out counseling services to individuals and groups. Board Certified Behavior Analyst (BCBA) – Completes functional assessments and provides behavioral supports to reduce incidents of problem behaviors and improve the adaptive and social skills of the clients. Assists in supervising interns. Behaviorist – Provides services to the clients in the Intermediate Care Facility (ICF) programs by developing plans that reduce incidents of problem behaviors and improve the adaptive and social skills of the clients. All of the Clinical Services staff persons provide training to staff persons in the agency and several have participated in workshops and training sessions at conferences open to the public. Typically, participation is open to individuals 18 years of age and older. Behavior Services and other clinical services have been made available to younger clients served by our Home-Based Services as well. If you would like more information about Clearbrook’s Adult Behavior and Counseling Services, please contact Mark Ammer, BCBA, Director of Behavior and Counseling Services at 847-385-5037 or mammer@clearbrook.org. If you would like more information about Clearbrook’s Therapy Services, please contact Roberta Hansen, PT, MS, Director of Therapy Services at 847-385-5072 or rhansen@clearbrook.org.